You helped her learn to walk. He’s totally potty trained at last. Just when it seems you’ve conquered the most angst-ridden issues faced by parents of toddlers, here comes another source of concern: In a world increasingly dominated by technology, familiarizing your child with a computer and online tools is more important than ever. Parents can’t afford to wait until their children start school to introduce them to technology, says Craig Cincotta, senior product manager at Microsoft Corp. Boy, is this person ever wrong. Children are becoming frustrated and angry, even at young ages because we are not allowing them to be children – children are meant to play, especially outdoors. Have you ever tried to toilet train a child too early? It doesn’t work. When children are ready, toilet training is easy. The same is true of education, computers and sports. Let children play freely, and when the time comes for studies and computers and organized sports, they will come ready to learn. Here is the email sent yesterday to Parental Wisdom members. Global climate change, pollution and how large a carbon footprint you leave behind may seem like many issues parents face – overwhelming. The answer is actually quite simple and lies in the ancient proverb that states we borrow the earth from our children. Unfortunately, we take our children from the very thing they gravitate to, the wonders of nature. We put them in schools too early, in front of computers too early, in organized sports programs too early, all because being inside and educated means they will be safe, smart and ready for a cutthroat world. According to a recent article in the Wall St. Journal, the birthplace of kindergarten is returning to its roots – quite literally. Children ages 3 to 6 walk into a forest outside Frankfurt Germany to sing songs, build fires and roll in the mud. To relax, they kick back in a giant ‘sofa’ made of tree stumps and twigs. Fredrick Frobel, the German educator who opened the world’s first kindergarten actually called it a “children’s garden.” He suggested that children of this age learn far more by playing in nature than they do immersed in letters and numbers. Let’s move from ‘No Child Left Behind’ to ‘No Child Left Inside’ and stop our 5-year-olds from what some educators call ‘early academic fatigue.’ If you can’t change the education system, at least you could give your children the gift of spending time with nature. Take a walk with your child and see what he sees, it’s amazing what a young child can teach you. 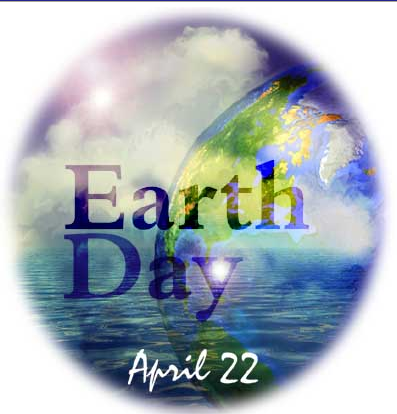 Perhaps if we made this a habit, there wouldn’t be a need to set aside April 22nd to remember the Earth; everyday would be Earth Day.